The Malaysian states of Sarawak and Sabah (East Malaysia), in the north, occupy about 26% of the island. The forested area here shrank rapidly due to heavy logging for the Malaysian plywood industry. Two forestry researchers of Sepilok Research Centre, Sandakan, Sabah in the early 1980s identified four fast-growing hardwoods and a breakthrough on seed collection and handling of Acacia mangium and Gmelina arborea, fast-growing tropical trees were planted on huge tract of formerly logged and deforested areas primarily in the northern part of Borneo Island. Indigenous peoples of Malaysia have been impacted by logging without their free, prior and informed consent in their ancestral forests. They have used peaceful demonstrations  and social media advocacy  to raise awareness of their rights to the forest, with some success. Questions about how and why logging licenses were granted without community consent remain unaddressed. The rainforest was also greatly destroyed from the forest fires of 1997 to 1998, which were started by the locals to clear the forests for crops and perpetuated by an exceptionally dry El Niño season during that period. During the great fire, hotspots could be seen on satellite images and the haze thus created affected the surrounding countries of Brunei, Malaysia, Indonesia and Singapore. In February 2008, the Malaysian government announced the Sarawak Corridor of Renewable Energy plan to harvest the virgin hinterlands of northern Borneo. Further deforestation and destruction of the biodiversity are anticipated in the wake of logging commissions, hydroelectric dams and other mining of minerals and resources. Approximately 73% of the island is Indonesian territory; the Indonesian name for the island, Kalimantan, is used in English to refer to the Indonesian-controlled territory. To combat overpopulation in Java, the Indonesian government started a massive transmigration (transmigrasi) of poor farmers and landless peasants into Borneo in the 1970s and 1980s, to farm the logged areas, albeit with little success as the fertility of the land has been removed with the trees and what soil remains is washed away in tropical downpours. The Mega Rice Project was initiated in 1996 in the southern sections of Kalimantan. The goal was to turn one million hectares of "unproductive" and sparsely populated peat swamp forest into rice paddies in an effort to alleviate Indonesia's growing food shortage. The government made a large investment in constructing irrigation canals and removing trees. The project did not succeed, and was eventually abandoned after causing considerable damage to the environment. The peat swamp forest in the south of Kalimantan is an unusual ecology that is home to many unique or rare species such as orangutans, as well as to slow-growing but valuable trees. The peat swamp forest is a dual ecosystem, with diverse tropical trees standing on a 10 to 12 m layer of peat - partly decayed and waterlogged plant material – which in turn covers relatively infertile soil. Peat is a major store of carbon. If broken down and burned it contributes to CO2 emissions, considered a source of global warming. A NASA satellite image showing the extent of 2015 Southeast Asian haze on 24 September 2015. It turned out that the channels drained the peat forests rather than irrigating them. Where the forests had often flooded up to 2m deep in the rainy season, now their surface is dry at all times of the year. The government has therefore abandoned the MRP, but the drying peat is vulnerable to fires which continue to break out on a massive scale. After drainage, fires ravaged the area, destroying remaining forest and wildlife along with new agriculture, filling the air above Borneo and beyond with dense smoke and haze and releasing enormous quantities of CO2 into the atmosphere. The destruction had a major negative impact on the livelihoods of people in the area. It caused major smog-related health problems amongst half a million people, who suffered from respiratory problems. Peat forest destruction is causing sulphuric acid pollution of the rivers. In the rainy seasons, the canals are discharging acidic water with a high ratio of pyritic sulphate into rivers up to 150 km upstream from the river mouth. This may be a factor contributing to lower fish catches. A joint UK-Indonesian study of the timber industry in Indonesia as a whole in 1998 suggested that about 40% of the throughput of timber was illegal, with a value in excess of $365 million. More recent estimates, comparing legal harvesting against known domestic consumption plus exports, suggest that 88% of logging in the country is illegal in some way. Malaysia is the key transit country for illegally logged wood products from Indonesia. A logging truck in Sarawak, Borneo. Deforestation in Borneo was historically low due to infertile soils, unfavourable climate, and the presence of disease. Deforestation only began in earnest during the mid-twentieth century. Industrial logging rose in the 1970s as Malaysia depleted its peninsular forests, and former Indonesian strongman President Suharto distributed large tracts of forest to cement political relationships with army generals. Thus, logging expanded significantly in the 1980s, with logging roads providing access to remote lands for settlers and developers. Logging in Borneo in the 1980s and 1990s was some of the most intensive the world has ever seen, with 60–240 cubic meters of wood being harvested per hectare versus 23 cubic meters per hectare in the Amazon. In Kalimantan for example, some 80% of lowlands went to timber concessions, including virtually all its mangrove forests. By the late 1980s, it became clear that Indonesia and Malaysia were facing a problem of timber crisis due to over-logging. Demand from timber mills was far-outstripping log production in both Malaysia and Indonesia. Most fires in Borneo are set for land-clearing purposes. 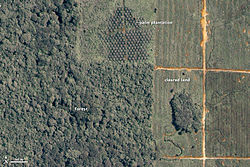 While the Indonesian government has historically blamed small-scale swidden agriculturalists for fires, World Wildlife Fund notes that satellite mapping has revealed that commercial development for large-scale land conversion – in particular oil palm plantations – was the largest single cause of the infamous 1997–1998 fires. Today fires are still set annually for land clearing in agricultural areas and degraded forests. When conditions are dry, these fires can easily spread to adjacent forest land and burn out of control. Increasingly, the frequency and intensity of fires is causing political tensions in the region. Neighbouring countries, in particular Malaysia and Singapore, blame Indonesia for failing to control the fires. In turn, Indonesia accuses Malaysian firms of starting many of the fire for land-clearing process. There is a need for a sustainable management of the forest’s resources, in particular the aspect of logging. But in order for that to materialise, there is a need to recognise that protection and conservation of the forest do not solely lie in the hands of Indonesia and/or Malaysia. It is unreasonable to assume that the few highly indebted countries that contain the majority of remaining rain forest should be responsible for single-handedly providing this global public good. It is a global effort to protect the rainforest which in turn, will then help to solve the development problems Indonesia and Malaysia face with regards to the Borneo rainforest. Recently a reforestation project in East Kalimantan has reported some success. The Borneo Orangutan Survival Foundation (BOS), founded by Dr Willie Smits, bought up nearly 2000 ha of deforested degraded land in East Kalimantan that had suffered from mechanical logging, drought and severe fires and was covered in alang-alang grass (Imperata cylindrica). The intention was to restore the rainforest and provide a safe haven for rehabilitated orangutans while at the same time providing a source of income for local people. The project was given the name Samboja Lestari, which roughly translates as the "everlasting conservation of Samboja". 1°2′44″S 116°59′15″E﻿ / ﻿1.04556°S 116.98750°E﻿ / -1.04556; 116.98750  Reforestation and rehabilitation is the core of the project, with hundreds of indigenous species planted. By the middle of 2006 more than 740 different tree species had been planted. ^ "SCORE Plan". RECODA. 2008. Retrieved 14 December 2008. ^ "Deforestation : Forest Loss in Borneo". Mongabay : Borneo. Retrieved 14 September 2011. ^ "Logging and Transmigration". Mongabay : Borneo. Retrieved 14 September 2011. ^ "Fires". Mongabay : Borneo. Retrieved 14 September 2011. This page was last edited on 8 June 2018, at 17:29 (UTC).